December 2, 2012 (LocalOrg) SOPA, ACTA, the criminalization of sharing, and a myriad of other measures taken to perpetuate antiquated business models propping up enduring monopolies - all have become increasingly taxing on the tech community and informed citizens alike. When the storm clouds gather and torrential rain begins to fall, the people have managed to stave off the flood waters through collective effort and well organized activism - stopping, or at least delaying SOPA and ACTA. However, is it really sustainable to mobilize each and every time multi-billion dollar corporations combine their resources and attempt to pass another series of draconian rules and regulations? Instead of manning the sandbags during each storm, wouldn't it suit us all better to transform the surrounding landscape in such a way as to harmlessly divert the floods, or better yet, harness them to our advantage? In many ways the transformation has already begun. While open source software and hardware, as well as innovative business models built around collaboration and crowd-sourcing have done much to build a paradigm independent of current centralized proprietary business models, large centralized corporations and the governments that do their bidding, still guard all the doors and carry all the keys. The Internet, the phone networks, radio waves, and satellite systems still remain firmly in the hands of big business. As long as they do, they retain the ability to not only reassert themselves in areas where gains have been made, but can impose preemptive measures to prevent any future progress. With the advent of hackerspaces, increasingly we see projects that hold the potential of replacing, at least on a local level, much of the centralized infrastructure we take for granted until disasters or greed-driven rules and regulations upset the balance. It is with the further developing of our local infrastructure that we can leave behind the sandbags of perpetual activism and enjoy a permanently altered landscape that favors our peace and prosperity. As impressive as a hydroelectric dam may be and as overwhelming as it may seem as a project to undertake, it will always start with but a single shovelful of dirt. The work required becomes in its own way part of the payoff - with experienced gained and with a magnificent accomplishment to aspire toward. In the same way, a communication network that runs parallel to existing networks, with global coverage, but locally controlled, may seem an impossible, overwhelming objective - and for one individual, or even a small group of individuals, it is. However, the paradigm has shifted. In the age of digital collaboration made possible by existing networks, the building of such a network can be done in parallel. In an act of digital-judo, we can use the system's infrastructure as a means of supplanting and replacing it with something superior in both function and in form. 1. Mesh Networks: The first shovelful of dirt is to building a dam, as developing a rudimentary mesh network is to building a parallel "second Internet." It is a small project a small group of people can work on, with a lot of resources already out there to start with. 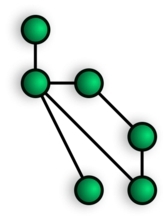 Image: A visual depiction of Project Byzantium's ad-hoc wireless mesh network. More information can be found on their website here. Such networks are being funded and passed out by the US State Department for use by "activists" to oust dictators in exchange for new ones, who coincidentally are US-backed. However, such networks also possess the ability to effect pragmatic change on a technical and local level. While these networks have been used to help activists around the world circumvent censorship as they fight to depose one dictator in favor of another, a charade funded by the US State Department - mesh networks can be used more effectively to simply supplant and replace centralized infrastructure and create our own local socioeconomic paradigms, no politics necessary. Instead of protests, local communities could focus on business, socializing, and building with their own two hands the sort of environment they desire instead of squabbling over who they'd like to "elect" to decide these matters for them. Project Byzantium, produced by Washington D.C.-based hackerspace, HacDC, meshes computers together wirelessly and features software that emulates popular services like Twitter, Facebook, Blogger, and Gmail. The result is a mini-Internet that works independent of both the Internet-proper, and the services typically used on it. For now, it is being leveraged by the US State Department and a myraid of corporate-funded foundations. This system will be selectively distributed to activists in anti-Western nations, and denied to activists struggling in despotic pro-Western nations such as Qatar, Bahrain, Saudi Arabia, Kuwait, Cambodia, Uganda, and many more. 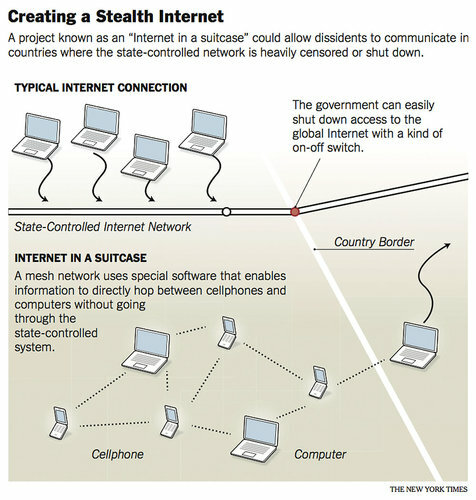 Image: A New York Times graphic depicts the differences between a traditional Internet network and a mesh network. While NYT maintains this would best suit "dissidents," presumably in nations designated "enemies" by Western governments, they in fact better suit people all across the West facing the corporate-cartels behind laws like SOPA and ACTA, as well as sweeps to disconnect, fine, or even imprison people for sharing files. The good people at HacDC have made their project open source and free to download. While they seek to help "activists," the mesh network solution they are sharing can easily be used to connect a local community together for constructive pragmatism instead of polarizing and destructive politics. 2. What will it Do? : With a mesh network running, a small area can begin operating as a miniature, second Internet. 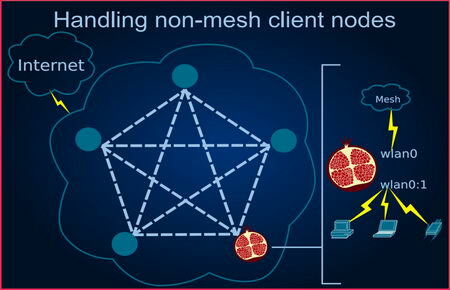 In the future, these mesh networks can be connected with neighboring networks, forming clusters, and collectively, eventually, they will run parallel to the existing Internet. But until that happens, what exactly would a local mesh be used for? Luckily, there is a lot it can be used for, and when local communities begin to leverage this mesh to its full potential, a lot of what we depend on our "dictators" for will be better done by ourselves locally. Education: The process of building a mesh network and maintaining it is an educational experience. Assuming that such a project would emanate from a hackerspace, the process of building, developing and maintaining the network could form the foundation of regular workshops and classes held there. Such courses could be done as a community service, and for extra income. The knowledge gained by working on a mesh network, developing applications for it, or media to be shared upon it, could lead to local small businesses, or the pursuit of a career in information technology. Everything from web-design to programming and media production could be taught, giving people useful skills while using their projects to help grow the local network. Of course, in the more traditional sense of education - lectures and coursework - this can also be hosted on local servers. Local tutoring houses can stream classes for those unable to make it to class. Lectures for university-level students could be streamed to larger groups than are able to fit in the average tutoring house. A local repository for open courseware (OCW) could be created by local schools. Communication: The most obvious benefit of a local network would be having a means to communicate in a variety of ways with other members in the community. Here in Thailand, even in the city, there is a strong sense of community, and one that would be enhanced with a local-specific network. Services similar to Skype, Gmail, and Twitter could all be used to tie the community closer together, replacing expensive phone services with free local calls. Similar opportunities exist with community broadband initiatives. Phones with WiFi capabilities could still be used with existing networks, but have the option of tapping into the local mesh. Business: Imagine a local mesh network with an interactive map similar to Google Earth that served as a local business directory where links and live updates could be made for those included in the local mesh. In a country like Thailand where everyone is an entrepreneur, this would be an invaluable tool to promote your local small business and give everyone on the mesh the ability to see what is new and what is available. Many times people will go to the "big" store down the road simply because they are unsure of what is available locally. With a mesh network, one could easily check what is available and what isn't before even leaving home. Local businesses here, also often deliver - another task that could be made simpler with a local mesh. An application for vendors that travel around a community could be made to show what they are selling and where they are, helping customers meet up with them. Local media: As technology improves and as it is translated into open source software and hardware, the ability for people to produce increasingly professional media on a smaller budget also improves. In addition to file sharing and hosting media taken from the existing Internet, locally produced media can also be produced and shared freely - ranging from local news and music, to video productions and art. Local news in particular, custom tailored to a smaller community, would better articulate and address the issues people are truly concerned about, rather than reflect a broader agenda simply sold to people by special interests. The news would be able to focus more around local announcements and events, warnings and security issues, accidents and safety issues. Collaboration/Socializing: The Internet has allowed people around the world to collaborate and socialize, but often at the expense of never getting to know one's neighbor. A local mesh would help bring down these barriers and encourage neighbors to communicate more. The role of a hackerspace in the community organizing the mesh would already go far in bringing people together for workshops to introduce the initiative. A nation is like a body, the local community like a cell. Healthy cells make a healthy body, and similarly healthy communities will lead to a healthier nation. Emergencies: In an emergency, a series of generators and permanent nodes in a mesh network could prevail where traditional networks might fail due to power outages. The role of local-specific news and communication, as well as a community that collaborates closer due to employing a mesh network would be obvious pay-offs particularly in an emergency. 3. An Orderly Transition: Of course, any of this could be done on the traditional Internet. But with a hackerspace established in a local community and working on a mesh network, it is more likely that if a block was connected together, people would begin communicating, collaborating, and networking locally to take advantage of it. As these meshes are developed and success stories trickle out, these successes will be replicated elsewhere and built upon. The combination of mesh networks, hackerspaces, community gardens, community labs, local tutoring houses to augment education, and other local initiatives, all stand to build stronger communities. 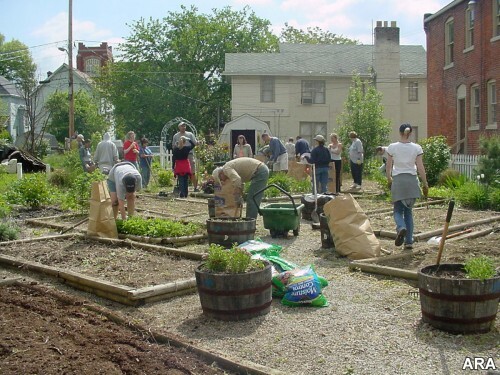 Image: A community garden. Mesh networks aren't a cure-all, they are one part of the necessary infrastructure we must begin developing locally to create the world we want to live in. Consider also, community gardens, an excellent way of strengthening communities while decentralizing food production. The strengthening of communities leads to increased self-sufficiency and self-reliance, decentralizing not only our dependence on big-telecom, but on other big-businesses as well as big-government. The idea is not to collapse the current system, or declare "independence" from one's nation - but to initiate an orderly transition from the current centralized paradigm to one as sensibly decentralized as possible. Mesh networks are the first experimental steps in the realm of communications - one of many realms that must be decentralized in pursuit of this new, local paradigm. There will always be a role for government, but that role needn't be all encompassing, nor need it be intrusive or overbearing. By undermining and replacing locally the special interests that grant governments and big-businesses in every country their power, we ensure that we not only unseat our dictators, but we remove the source of power their replacements will inevitably seek to abuse in their stead. Check here to see where the closest hackerspace/makerspace is and drop by for a visit. Express your interest in this project and see who else is interested in network hacking and mesh networking. If there are no hackerspaces in your community, look into organizing one yourself. Until then, Google Groups has served as a good meeting place for those with similar interests - perhaps there are other people in your area interested in mesh networking. Reach out to them. The Project Byzantium site is a good resource to begin looking into regarding mesh networks, as well as Wikipedia's entry on Mesh Networking - especially the references and external links. Included is a DIY guide to building a rural mesh network (.pdf). If you are already developing or deploying a mesh network and want to share your story, please contact LocalOrg at cartalucci@gmail.com. Tell us about it, how you are using it, and where you see it going in the future.